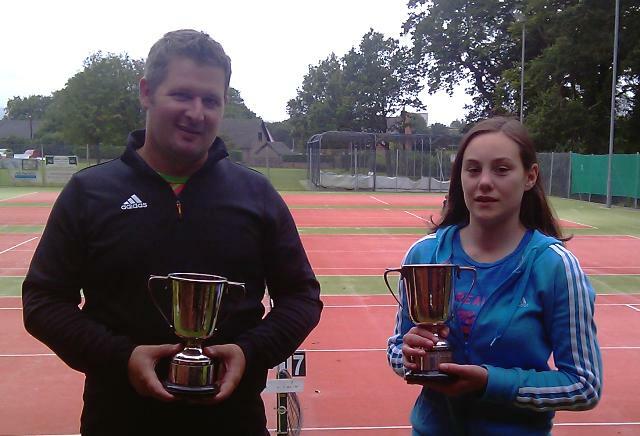 Dumfries Tennis Club recently held their Club Championship Finals. With 10 Senior Titles and 7 Junior Titles up for grabs it promised to be an exciting day and it didn’t disappoint. Play started at 10am with the first junior title at stake, with play commencing on the other 3 courts at 10.30am. The men’s singles final was viewed as “the big one” with Colin Dunbar defending the title that he has won for the last 3 years against the previous winner and club stalwart Lister McKiddie. With Colin starting as favourite he quickly got into his stride and took the first set but Lister upset the form book and comfortably took the second, to take the match to a deciding 3rd set. Lister continued on fine form into the third set with an early break of serve and the large crowd watching thought an upset was on the cards. However, Colin regained his composure to just edge the match 2-1 in sets to make it 4 singles titles in a row. In the Ladies final, defending champion 15yrs old Sophie Robinson regained her title beating Rebecca Topping 2 sets to nil. Mixed Handicap Doubles – Steven Forsyth & B McCubbin. and last but not least is the U10s singles winner Adam Kirk, who regained the title for the 3rd year in a row. Congratulations to all the winners.